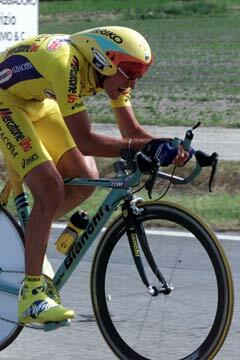 Vittoria shoes has sent us some photos from the 2000 Giro d'Italia, won by Stefano Garzelli using Vittoria shoes. There are more of these photos on another page: click here to see them. 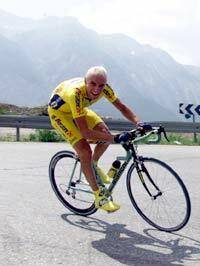 Above, and the next two photos, show Stefano Garzelli in the final time trial that gave him the race leadership. 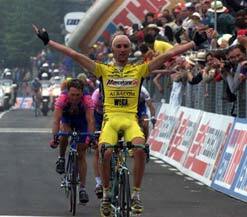 Garzelli wins stage 18 in Pratonevoso. The Mercatone team in Torino before the start of the last stage. 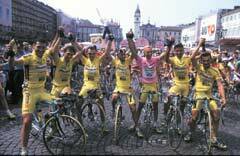 Garzelli is at the center in pink; Marco Pantani is to his right. 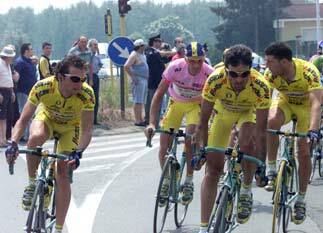 Garzelli, in pink, rides into Milan with teammates De Paoli, Forconi, and Brignoli. 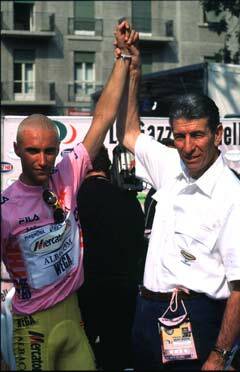 Stefano Garzelli with Felice Gimondi after the race. Gimondi looks thin and fit enough to have raced the Giro himself.